3D-CQU system, Providence region. 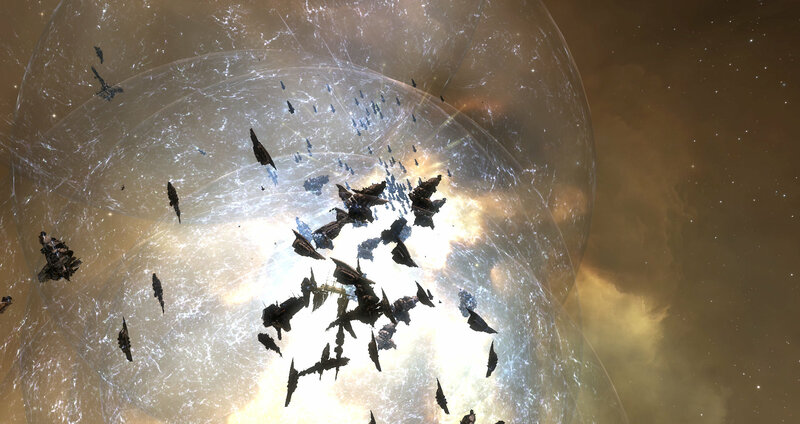 On the 7th of September at 18:12 EVE Standard Time, Providence Bloc and Pandemic Legion [-10.0] clashed over a Raitaru engineering complex in the system. The battle was fought over an engineering complex anchored by WAFFLES. [N0MAD]. The alliance had been deployed to the area for some time and tried to coax Providence Bloc into a confrontation over the anchoring structure. Providence Bloc obliged, responding via forming a 180 pilot Machariel battleship fleet supported by three squadrons of combat carriers and force auxiliaries, a wing of electronic warfare frigates as well as a squadron of stealth bombers. Against this, WAFFLES. and Pandemic Legion formed a joint 170 pilot Machariel fleet of their own which included four capital squadrons: three dreadnought squadrons and a force auxiliary squadron which served as the logistics backbone of the fleet. The force made its way to the system with its capital ships in tow, arriving at the adjacent F-YH5B system only to find Providence Bloc waiting on the other side of the 3D-CQU gate. Providence Bloc had positioned its fleet 70 kilometers off the gate, its combat carriers deployed, and was ready to engage the hostiles. Pandemic Legion/WAFFLES. jumped into the system, its ships holding cloak as long as possible. Providence Bloc opened fire on those ships that de-cloaked, scoring a few early kills before the rest of the Pandemic Legion/WAFFLES. fleet anchored up and returned fire. The two fleets traded artillery barrages, settling into a long range exchange. The Pandemic Legion/WAFFLES. dreadnoughts entered siege cycles and targeted the Providence Bloc capitals while the Machariel fleet focused solely on its counterpart. Providence Bloc alternated between the hostile battleships and capital ships. The two sides exchanged mainline ships for a few minutes, both struggling to overcome the massive armor tank the battleships possessed. Providence Bloc lacked the critical mass to simply volley ships while Pandemic Legion/WAFFLES. was unable to deliver a concentrated artillery strike. As the battle progressed the Pandemic Legion/WAFFLES. force auxiliaries settled into its rhythm, their remote armor repairers catching many stricken ships and kept them alive. The same could not be said for Providence Bloc as the Pandemic Legion/WAFFLES. fleet became more disciplined in its fire, delivering a powerful barrage that overcame the armor of the opposing battleships. In the capital front, Pandemic Legion/WAFFLES. fared much better. The dreadnoughts tore through the ranks of force auxiliaries and combat carriers turning most of them into scrap. Providence Bloc attempted to retaliate and managed to take down a single dreadnought at the start but it was not enough. Surviving combat carriers and force auxiliaries warped off rather than face certain annihilation, freeing the dreadnoughts to target the embattled Providence Bloc Machariel fleet. The addition of the dreadnought firepower to the mix didn’t help things for Providence Bloc’s already stressed logistics wing. With Pandemic Legion/WAFFLES. strikes proving lethal, Providence Bloc sought to increase the distance between the two fleets to negate some of the damage. Pandemic Legion/WAFFLES. attempted to give chase but because they were shackled to their force auxiliaries, they were unable to close the gap properly. Still, even as the distance between the fleets grew, Pandemic Legion/WAFFLES. was able to volley the hostile Machariels. Things grew dire for Providence Bloc when a third party Rupture cruiser fleet joined the fray. The Rupture fleet warped at range from the Providence Bloc logistics wing and opened fire on the logistics cruisers. Though unable to incur any losses, the added pressure was enough to force Providence Bloc fleet commanders’ hands in the face of a losing battle. Their logistics wing under fire, their fleet unable to hold and their capital support destroyed, it was time to order a retreat. The Providence Bloc Machariel fleet warped off the grid as Pandemic Legion/WAFFLES. attempted to catch as many ships as it could and dispatch stragglers. Once the grid had been won, the Rupture fleet withdrew as well, leaving Pandemic Legion/WAFFLES. in command of the F-YH5B gate. The remaining Machariel fleet started extracting its capital ships, warping them to the anchored Raitaru which had attempted to online during the fight. Providence Bloc tried to use a stealth bomber squadron to destroy the Raitaru while the main fight raged but Pandemic Legion/WAFFLES. support pushed it off. With the grid nearly clear of capital ships, Pandemic Legion was ready to warp off as well when Providence Bloc returned to the field. Providence Bloc was not about to give up on its objective and had its fleet reship to Cerberus heavy assault cruisers. The reconstituted fleet warped back to the 3D-CQU gate and jumped into the waiting battleships. Pandemic Legion/WAFFLES. scrambled interdictors to the gate in an attempt to lock it down and opened fire on the de-cloaking heavy assault cruisers. The warp disruption probe cover however proved inadequate and the heavy assault cruisers burnt away from it with relative ease, suffering a few losses before warping to the Raitaru. Pandemic Legion/WAFFLES. followed suit and warped to the structure for a second round. The Cerberus fleet landed at long range of the structure, remaining around 150 kilometers from it. The heavy assault cruisers locked on the engineering complex and started bombarding it with their missile barrages, ignoring the Machariel fleet completely. The Machariel fleet took advantage of the fact and opened fire on the heavy assault cruisers, cutting many of them down. The battle became a massacre as heavy assault cruisers fell by the dozen to the Machariels’ guns. 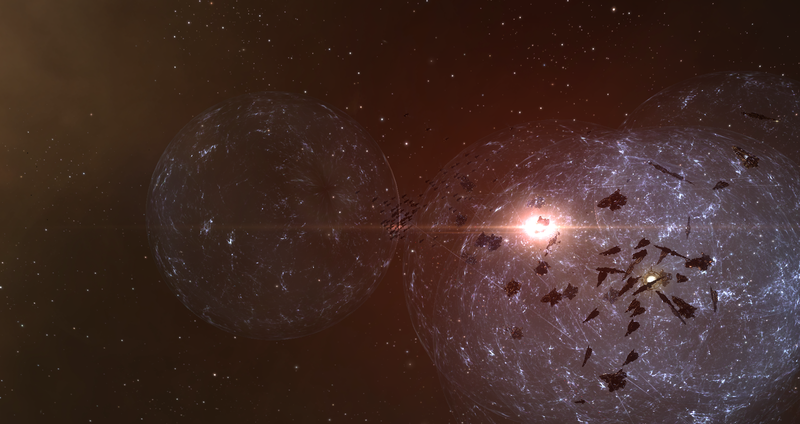 Yet Providence Bloc didn’t waver for a moment and kept firing at the Raitaru. Time after time it would warp to a ping, forced to by the approaching battleships and stealth bomber runs. Each time the fleet would align to a new direction while locking up and firing upon the engineering complex. Slowly it whittled down the structure’s hit points to 0, resulting in its destruction. With the Raitaru destroyed and their objective won, the remaining heavy assault cruisers warped off, conceding the field to Pandemic Legion/WAFFLES..
Having won the field, Pandemic Legion/WAFFLES. remained in the system for a while, looting and securing their capital ships. Once the capital ships had jumped out, the rest of the fleet followed suit and left the system behind. With this the battle for 3D-CQU came to an end. Battle report for the 3D-CQU system can be found here. All told the battle lasted an hour with Time Dilation spiking a few times but never rising above 60%. The system itself held approximately 600 pilots at one point in the fighting. It is important to note the role of several stealth bomber groups which took part in the fight. Both Pandemic Legion/WAFFLES. and Providence Bloc employed bomber squadrons to harass and soften enemy fleets with varying degrees of success. Several other stealth bomber squadrons also operated in the system, seemingly favoring the attackers as Providence Bloc received the brunt of the bomb damage. Pandemic Legion and WAFFLES. lost a combined 22 ships including 1 dreadnought and 7 battleships for a total of 11.25 billion ISK damage. Providence Bloc lost a total of 316 ships including but not limited to 6 force auxiliaries, 15 combat carriers, 24 battleships and 70 heavy assault cruisers for a total of 102.51 billion ISK damage.